Balloons and cake. That’s what we promised L if she could go three days without an accident. It took a couple tries, but she did it and we lived up to our end of the bargain. We made a stop at Party City in Portage to pick up her balloons. She picked out two Frozen balloons and they lady blowing them up gave her a pink one and a blue one to go with them. As we left Party City, we started talking about where to go for cake. I figured we’d just do something from Harding’s or Meijer like we usually do, but J said she had heard Boonzaaijer Bakery did mini cakes that you could just walk in and buy. Unfortunately, they are closed for a while according to a sign on their door, so we needed a back up. Luckily, I always have a back up. After striking out at Boonzaaijer, I turned the car back towards Kilgore to the shopping center on the corner of Westnedge and Kilgore right at the city limits. 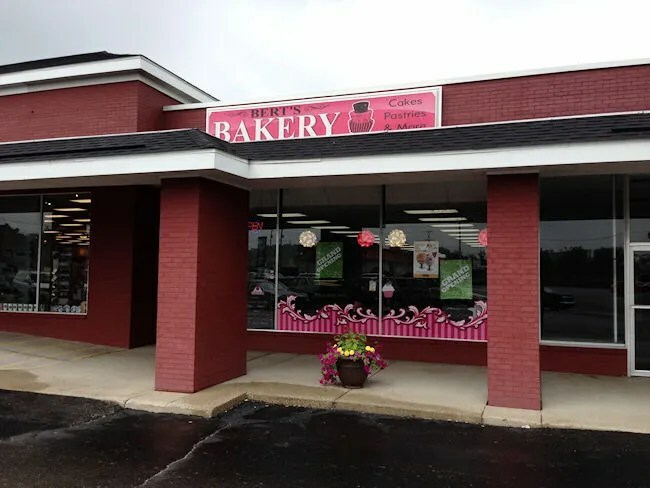 There’s a bakery that has been there for a while but with us not living on that side of town anymore, we haven’t had a reason to stop in. Bert’s Bakery on Westnedge is the second location for the small business. The original location is out on River Street. The space that Bert’s takes up is actually quite large. The pastry cases are all near the back of the dining room. The large space is filled with tables which seems odd for a bakery, but they actually do more than just cakes. They have somewhat recently started serving lunch. We had already eaten, so we didn’t really pay attention, but they have a handful of sandwiches that are made fresh in their kitchen plus rotating soups that are posted on their Facebook page. We were in the market for sweets and somehow, we were both able to walk by the gelato case which features a wide range of Palazzllo’s Gelato. That’s some self control right there, I tell you what. The bakery case has a number of different sweet treats available on a daily basis. The bulk of their business is order ahead cakes, but we don’t plan things out too well and we were just looking for something little. They didn’t have any little cakes on display, but they did have cupcakes. 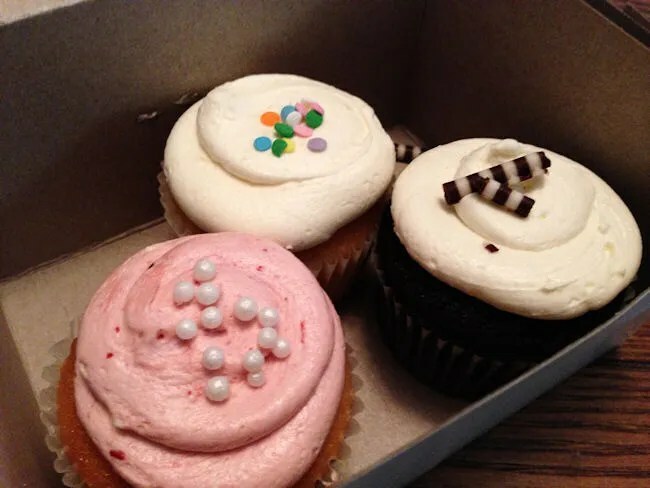 L doesn’t really know the difference and we all like cupcakes, so we each picked one out. The lady behind the counter boxed up the three cupcakes in to a little box. The cost was just under five bucks for all three. They’re not expensive as other cupcake places, but their not as complicated either. When we got home, we got L set up at the kitchen table and she couldn’t wait for us to get her “cakee” out. She liked the one with pink frosting and white sprinkles. I stayed simple and got the white cake with vanilla frosting and J got a chocolate cake with vanilla frosting. The cupcakes were dense and moist. I was able to eat mine in about two bites. Again, it wasn’t huge and was a simple cupcake, but it was also simply delicious. L devoured her cupcake and asked for another. She didn’t get another, but we distracted her with balloons. 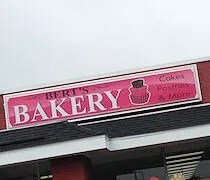 Bert’s Bakery is a delicious little bake shop. They offer a lot more than just cakes so don’t forget about this place when you have a sweet tooth giving you a problem.